Home > Articles > 594 > Too Much Fertilizer for Transplants? ​Sometimes newly transplanted crops don’t take off like we’d expect. 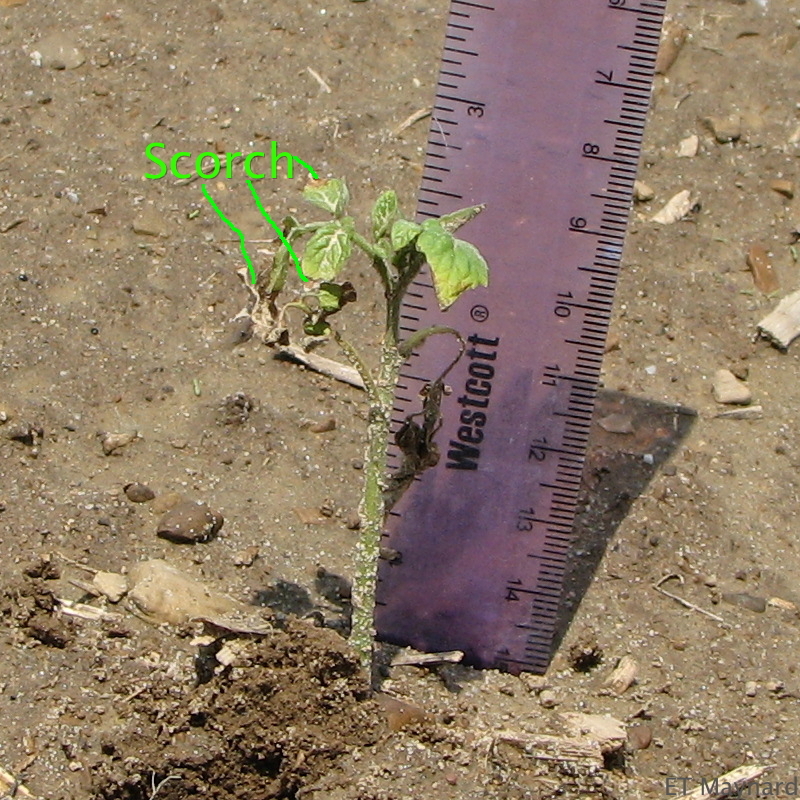 Consider the newly transplanted tomato seedlings in these images. In Figure 1, lower leaves are chlorotic (yellow) and leaflet edges and leaves curl downward. In Figure 2, lower leaves are chlorotic or bleached and some had necrotic (dead) spots. In Figure 3, some leaves have died and others have ‘scorched’ margins or tips. Figures 1 and 2 are from a high tunnel; Figure 3 is from the field. What they have in common is that the tomato plants are not thriving after transplanting. It may be hard to say exactly what is going on with each of these, but it would not be surprising if they were cases of over application of a fertilizer or soil amendment, leading to toxicities for the plant. Ammonium toxicity is common when soil is cool and wet, soil pH is low, and there is a large amount of ammonium in the soil. Typical symptoms show up on leaves and can include interveinal chlorosis (yellowing between the veins) that eventually may turn brown and die, and leaf edges that curl up or down. A look at roots may show death of root tips. High levels of ammonium in the soil can occur when fertilizers that release ammonium are applied at high rates, and the soil conditions mentioned above limit bacterial conversion of ammonium to nitrate. Examples of fertilizers that release ammonium include urea, ammonium nitrate, and organic fertilizers. At low levels, ammonium is not toxic to plants, but when a plant takes up too much, the plant cells can be injured. To avoid ammonium toxicity, avoid concentrated applications of ammonium-producing fertilizers near the plant when soil is cool and wet, especially if pH is low. Salt injury occurs when fertilizer and other salts in the soil become high enough to injure plant tissues. Symptoms typically include scorching at margins of leaves and death of roots. High soil salts are usually a result of applying too much fertilizer, or applying in too concentrated an area. It is likely that this is the cause of symptoms in Figure 3. Avoid salt injury by applying fertilizers at recommended rates, mixing them evenly into the soil, or if not mixed, applying in a narrow band away from seedling roots or seeds, .e.g. 2 inches to the side and 2 inches below seeds. Transplant starter solutions can also cause salt injury if they are too concentrated, or if the soil dries out shortly after they are applied, concentrating salts in the root zone. If fertilizer does not dissolve completely or is not well mixed in the solution, salt injury may result because solution at the bottom of the tank is too concentrated. In high tunnels that remain covered year round, salt problems can build up over time. Yearly applications of more nutrients than the plants use builds up nutrients and salts in the soil. Without rain or extra irrigation to leach salts out of the root zone, levels can be high enough to injure plants. If a drip or other micro irrigation system is used, salts will tend to build up at the margin of the area of soil normally wet by irrigation. Measurements taken across a bed may show differences in salt levels in the soil. To avoid problems from fertilizer buildup over time, routinely sample soils and send to a lab for testing to monitor trends in nutrient and salt levels. Adjust fertilizer applications accordingly: reduce applications of nutrients that are building up to excessive levels. Work soil between crops to disperse bands of salt built up. If you suspect drip irrigation has led to bands of higher salt areas in a bed, take multiple samples across the width of the bed, and send to lab for a test of the salt level at the different locations. If salt levels become too high, applying water to leach salts below the root zone will reduce the problem. Ammonium toxicity and high salts are just two reasons plants might not establish well after transplanting. Others include an air gap between root ball and soil, injury to the seedling stem, cold soil or air temperature, dry soil, a transplant that is not suitably hardened off, and soil applied herbicides with a narrow margin of safety for the crop. Care taken to avoid these problems pays off with a crop that takes off after transplanting, ready to achieve its full potential. Figure 1. Young tomato transplant in a high tunnel with chlorotic lower leaves. Figure 2. 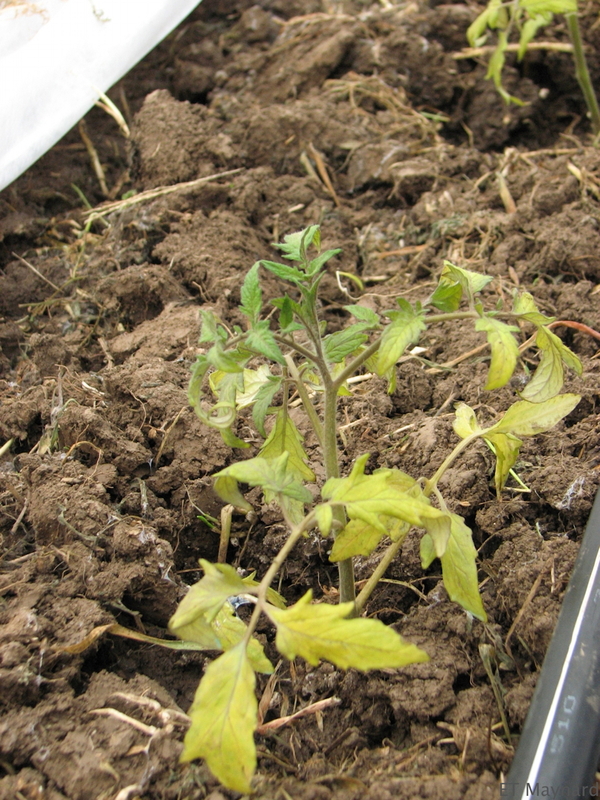 Young tomato transplant in a high tunnel with chlorotic, bleached, and necrotic lower leaves. Figure 3. 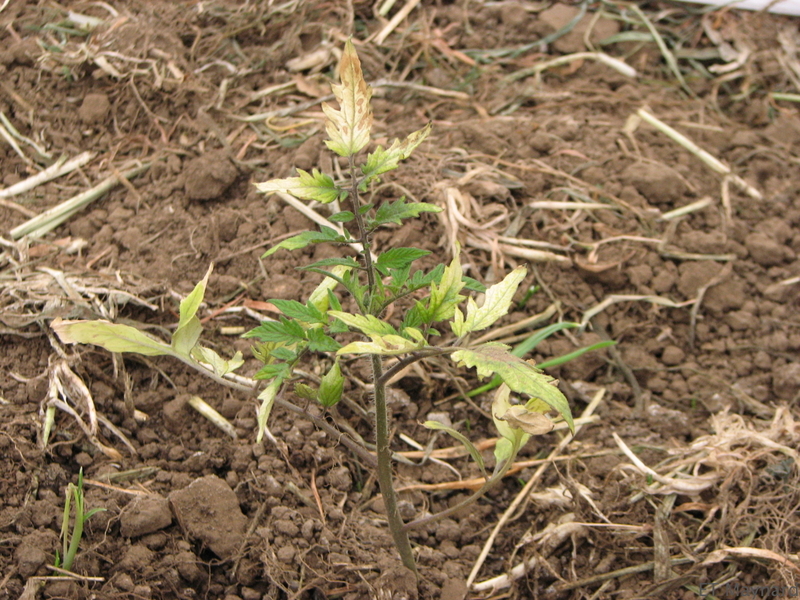 Young tomato transplant in the field with scorched leaf margins and dead leaves.